The bulls have taken the stocks up by 3.5% on the last week. There was a positive mood among the traders with decreased volatility almost to pre-February levels. A current market review suggests mostly positive events. President Donald Trump excluded Canada and Mexico from the steel and aluminum tariff plan. North Korea surprisingly wants to be friends with the US. In the jobs market, the economy added 313k jobs – much more than expected 205k. Finally, the most important, the wages grew 2.6% over a past year, which is lower than expected and lower than 2.9% – last month reported. This is an important catalyst of Friday’s stock surge and important fact for market participants to evaluate their trading strategies. Summing all up together we can conclude perhaps positive perspective for the stocks based on the market review. Let’s see how each major index is positioned at the moment. The price rose at the start of the week and wriggled around inner trend line (orange dashed line) until it rose up again on Friday. A current resistance is the outer trend line (wide red line), although once a 20 EMA crossed back a 50 SMA, the long-term resistance will be broken again. A current support level is still 100 SMA / lower inner trend line (orange dashed line). The consolidation is building up pretty well, although we will need probably a couple of more weeks to draw a clearer picture. 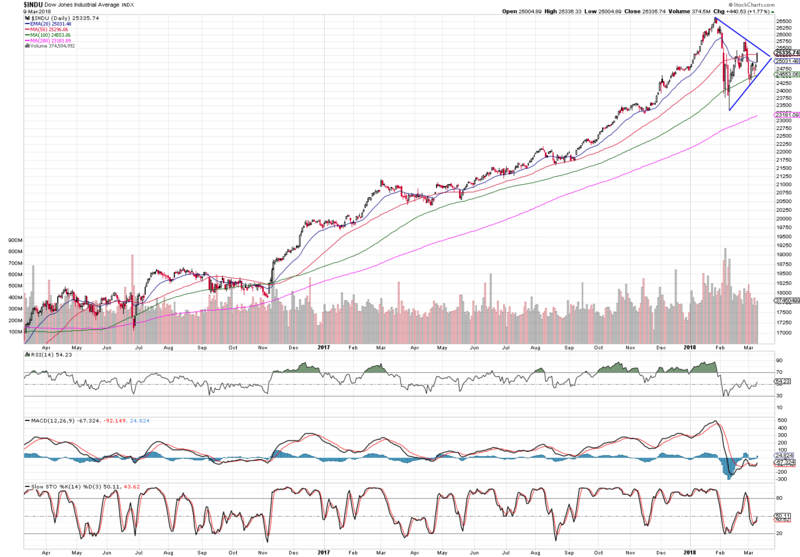 Dow managed to break through the 20 EMA bouncing from 100 SMA that servers currently at its support level. The recent price movements have formed a triangle pattern. Thus, a breakthrough a blue line should indicate a right entry point. It is very likely to happen this week considering the timescale and general market overview. Nasdaq has been a top performing index for some time and its chart is proving the fact. It has pierced through all the resistances and most of all it has closed above the highest high. No doubt technology industry keeps rolling in the stock market, while every market review has been proving it so far. However, there is one important detail that needs to be watched. 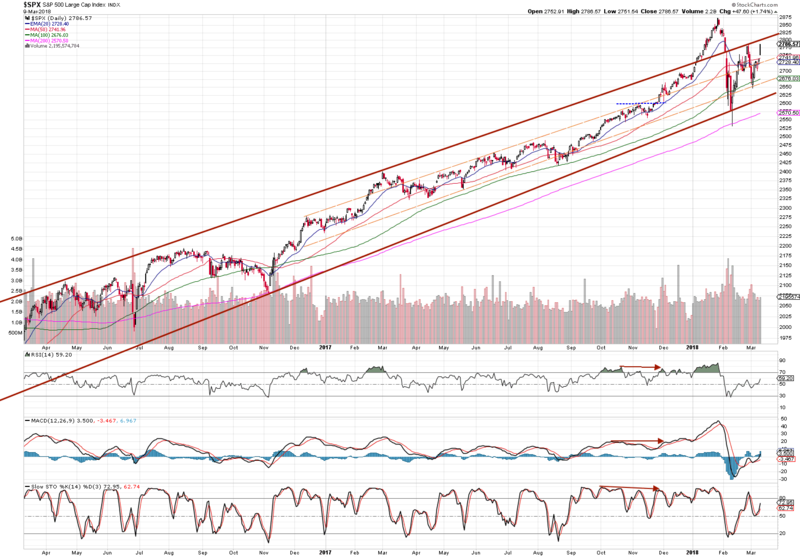 The RSI and MACD are showing slight bearish divergence (click on the chart to see it). 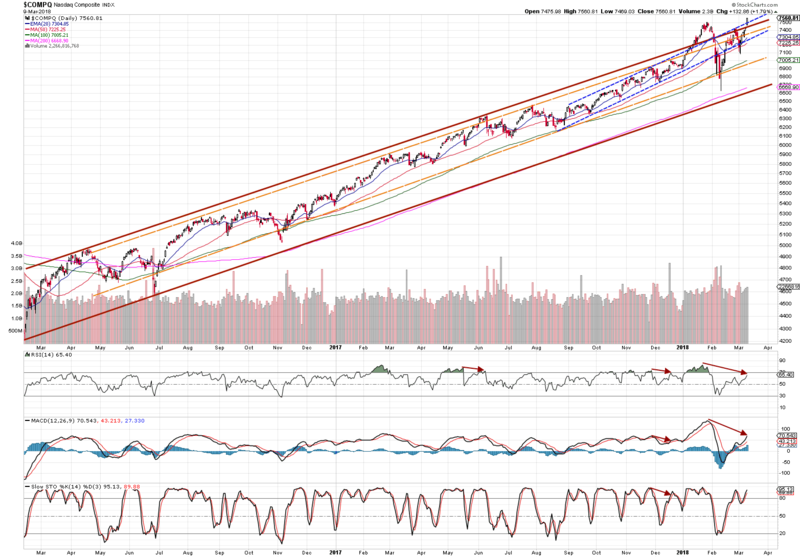 The index has been successfully following blue trend channel, where you can see the support was always 20 EMA. Thus, it is very likely that Nasdaq will be finding its support at 20 EMA in near future to eliminate current bearish divergence. The index seems to be still in a correction. It has failed to break back above the current resistance first time. General optimism among the markets has pushed the index upward direction last week, unfortunately not enough to consolidate for the further bullish environment. The stock markets’ consolidation is strengthening. Based on current information that we have on hand it is reasonable to enter good quality stocks before it takes another run upwards. Important is to stay disciplined and focused on big trend!